Oil and other medicated fluids like milk, buttermilk, tender coconut water are poured on to the patient’s forehead for a specific period of time. All types of diseases that affect the head, hyepertension stress, hair loss, among others. Therapeutic oil is allowed to stay in the patient’s head for a specific period time. Leather or rexin cap is used for this purpose. Paralysis, cervical lumbar spondylosis, frozne shoulder, wasting of muscles, general weakness, all muscular and skeletal diseases, sexual weaknesses. Lower back pain, IVDP (inter vertebral disc prolapse), sciatica, hip pain and other lower limb muscular radiating pains, skeletal disorders. 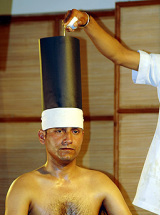 Warm medicated oil is poured into the affected parts of the body. Circular ring is made by urad dal dough on the affected body parts. Obesity, and fat deposition in abdomen. Herbal powders with fat reducing properties are massaged all over the body to reduce fat deposition and boy mass. Special therapy for OA ligament teals and oestosporotic changes in kenn joints. Weak ligaments, bones and joints, eruptions. Warm medicated oil is poured in affected areas. Circular ring made by urad dhal dough is applied in knee joints.